Sixteen-year-old Miranda is a normal girl who lives in Howell, Pennsylvania. When news of an asteroid hitting the moon becomes all anyone can talk about, it just seems like an excuse for her teachers to assign more homework. Asteroids have hit the moon before, but this is the biggest one on record. The world is shocked when the asteroid knocks the moon out of orbit and closer to the earth. Suddenly, the life Miranda has always known is gone. The world is suddenly hit by tsunamis, earthquakes and volcanic eruptions. With unreliable electricity and shortages on gas and food, Miranda and her family have to worry about surviving for the first time in their lives. Things they have never had to consider are decisions they have to make daily. Can Miranda refuse helping others if it means keeping her family alive for another day? Will she put her younger brother’s survival ahead of her own? When the world seems to be falling apart, Miranda writes a candid journal about life as she knew it. I should start out by saying that this book freaked me out a little bit. This may have been because I finished it at night, but I think it was mainly because what happens to Miranda doesn’t seem so distant from our reality. While the futures shown in novels such as The Hunger Games feel very far away, the events in this novel feel like they could actually happen. And some of them have, on a smaller scale. Natural disasters happen much more frequently than they should. People are recurrently predicting the end of the world, the most recent being last May. In the weeks leading up to the millennium, I’d go to a friend’s house and their basement would be stocked with canned food, matches and emergency supplies. The panic leading up to Y2K reminded me a bit of the panic in this book, except one was warranted and the other was not. I’ve also known people who were living in Quebec during the 1998 winter blackout, and had to worry about keeping warm. Knowing people who have had similar experiences to Miranda’s family makes this book feel very real. Life As We Knew It is told in Miranda’s diary entries, and I can’t help but wish it wasn’t. The book dragged along a bit in the middle, and I feel that it would have worked better in a different format. Miranda appears to be a lot younger than sixteen in her diary, and maybe this wouldn’t have been the case if it were simply told in the first person. Despite this, I couldn’t stop reading. Even if some parts were slow, I still was dying to know what was going to happen next. The plot is mainly focused on Miranda’s daily life, and there isn’t a lot of action. However, I think the author’s ability to emotionally affect the reader offsets any flaws in the writing. I found myself bringing Miranda’s world into my own and worrying about the fact that we don’t have a wood stove in our house. It was interesting to see how different characters dealt with things, such as Megan immersing herself in religion and Dan and Sammi leaving Pennsylvania. Miranda’s mother was hard to relate to at times, especially since I have trouble understanding how she could put one child ahead of the others. Of course, I’m not a parent and I’ve never been in any life-threatening situation, so I can’t claim to truly understand what she was going through. Early on in the novel, Miranda’s mother decides that her family is the most important thing, no matter what. A lot of interesting questions are asked throughout he novel, such as the cost of survival and whether you’d be willing to put your own well being over a friend’s. This book would definitely be a good choice for a teen book club. Susan Beth Pfeffer took an interesting concept and turned it into a gripping and unsettling novel about an average family fighting for survival. This book had a strong effect on me, and it succeeded at making the events of this novel feel so real that I couldn’t help being a bit paranoid. 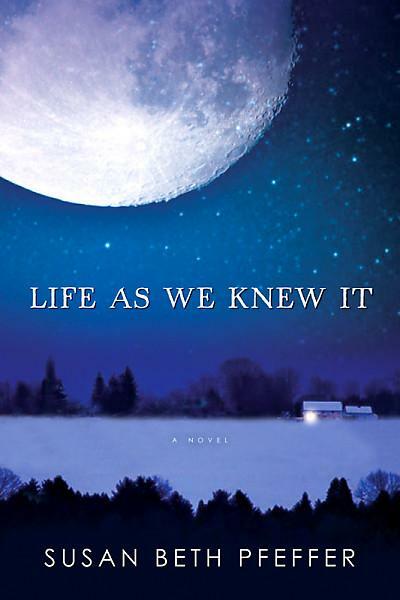 A quick and thought provoking read, I’d definitely recommend Life As We Knew It.